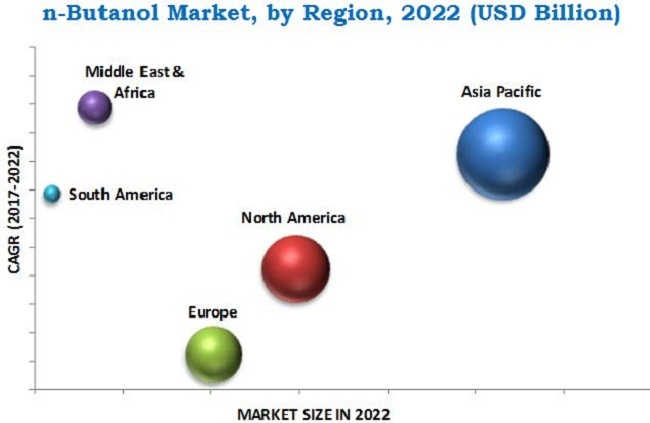 The n-Butanol market was valued at USD 3.89 billion in 2016 and is projected to reach USD 5.58 billion by 2022, at a CAGR of 5.9% during the forecast period. In this study, 2016 has been considered as the base year, while the forecast period is 2017 to 2022. Butyl acrylate is one of the highly produced derivatives from n-Butanol. It is an acrylate monomer used in latex paint formulations in industrial & architectural activities, enamels, textiles, and paper finishes. Acrylates are commercially manufactured using acrylic acid and n-Butanol as feedstock. Nearly 40.0% of the total n-Butanol produced was used for manufacturing butyl acrylates in 2016. The market for butyl acrylate is directly linked to the booming construction industry as it is used in solvent-based industrial & architectural paints, enamels, textiles, and paper finishes, which majorly drive its demand around the globe. The considerable growth of the construction industry in various regions, including APAC, is driving the demand for construction materials including paints, coatings, and adhesives. Thus, the increasing demand for n-butyl acrylate is a key driver for the increasing demand for n-Butanol. 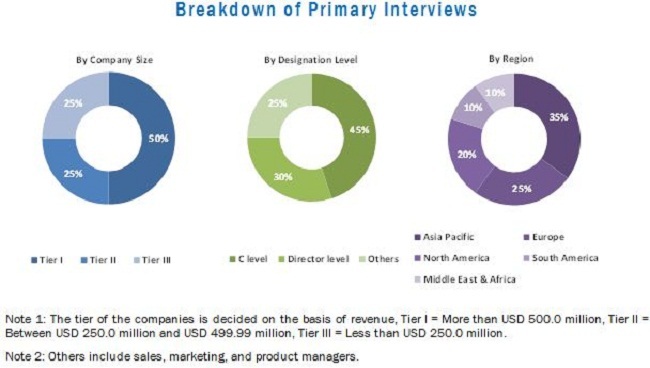 In this report, market sizes have been derived from various research methodologies. In the secondary research process, different sources have been referred to identify and collect information for this study on the n-Butanol market. These secondary sources include annual reports, press releases, investor presentations of companies and associations (such as Coatings world, ScienceDirect, ACS Publications, and others) and white papers, certified publications, and articles from recognized authors. In the primary research process, sources from both supply and demand sides have been interviewed to obtain qualitative and quantitative information for this report. The bottom-up approach has been used to estimate the market size, in terms of value. The top-down approach has also been implemented to validate the market size, in terms of volume. With the data triangulation procedure and validation of data through primaries, exact values of the sizes of the overall parent market and individual markets have been determined and confirmed in this study. The figure below illustrates the breakdown of profiles of primary interview participants. Leading companies operating in the global n-Butanol market, are The Dow Chemical Company (US), OXEA (Germany), and Mitsubishi Chemical Corporation (Japan). In December 2017, Mitsubishi Chemical Corporation had a collaboration agreement with MET Gas Processing Technologies (Italy) over the licensing of a process for manufacturing oxo alcohols, acrylic acid, and acrylic acid ester from natural gas. Mitsubishi will proactively expand licensing business through the collaboration to meet the growing demand for propylene and its derivatives. In March 2016, Saudi Butanol Co (SABUCO) started its commercial operation of producing n-Butanol in Jubail, Saudi Arabia. SABUCO is a joint venture between Saudi Kayan Petrochemical Co, Sadara Chemical Co, which is a joint venture between Saudi Aramco and The Dow Chemical Company, and Saudi Acrylic Acid Co (SAAC). The company has the capacity of producing 330 KT/year of n-Butanol, and 11 KT/year of isobutanol. This is expected to help in strengthening the downstream operations of the Saudi Arabian market. In February 2015, Oxea completed the expansion of its oxo alcohol production capacity in the Texas, US. The company announced 25% production expansion, in May 2013. The full realization of this expansion work is completed, and capacity is gradually being brought online. With the 25% capacity increase, the plant capacity has now reached 287.5 KT/year and 100 KT/year for n-Butanol and butac, respectively. This capacity expansion helped the company to increase its business reach in the oxo alcohol market of North America. Each region has been further segmented into key countries in that region. What are the upcoming trends for n-butanol market? Country-level analysis of the n-butanol market is provided by application. The n-Butanol market is estimated at USD 4.18 billion in 2017 and is projected to reach USD 5.58 billion by 2022, at a CAGR of 5.9% between 2017 and 2022. The growth of the market is driven by the increasing demand for n-Butanol as a direct solvent and industrial intermediate in industries such as construction, automotive, textile, agrochemical, etc. In addition, increasing GDP, growing industrialization, and rapid urbanization in developing countries have also contributed to the demand for n-Butanol, globally. Butyl acrylate is projected to be the largest application segment of the n-Butanol market during the forecast period, in terms of both value and volume. As butyl acrylate enhances the flexibility, softness, and durability of coating resins, it is largely used in surface coatings, textiles, adhesives, inks, and several other applications. Butyl acrylate is also used to make homopolymers and copolymers for use in water-based industrial and architectural paints. Volatility of raw material prices and decreasing consumption of DOP (Bis(2-ethylhexyl)phthalate) in Europe and North America are identified as the key restraining factors for the n-Butanol market growth. The consumption of DOP has declined drastically in the past few years in developed countries owing to its harmful impacts on exposure to humans. As DOP is primarily derived from n-Butanol, the regulation imposed on DOP also hampers the demand of n-Butanol in North America and Europe. Asia Pacific is projected to be the largest market for n-Butanol during the forecast period. The demand for n-Butanol is high in this region due to the region’s large industrial base for the production of glycol ethers, butyl acrylate, and butyl acetate. 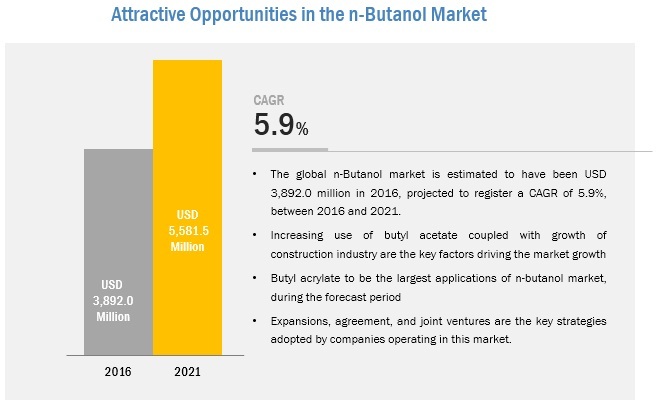 Moreover, rising urbanization and increased infrastructural developments in emerging economies, such as India, China, and Malaysia are also expected to boost the demand for n-Butanol in this region during the forecast period. N-butanol is used in various applications such as butyl acrylate, Butyl acetate, glycol ethers, direct solvent, and plasticizers. Butyl acrylate is an acrylate monomer. It is a clear, colorless, and flammable liquid with a fruity odor. It has a flash point of around 360°C and is easily miscible with various organic solvents. It is readily polymerized and displays a wide range of properties depending upon the selection of the monomer and reaction conditions. Butyl acrylate is mainly used to make homopolymers and copolymers for use in water-based industrial and architectural paints. It is also used in cleaning products, antioxidants, enamels, adhesives, textiles, and seals and paper finishes. Butyl acetate, also known as butyl ethanoate, is a transparent solvent with molecular formulae C6H12O2. It is produced by esterification of a butanol isomer and acetic acid in the presence of a strong acid such as sulfuric acid. It has good solvency characteristics for resins, polymers, cellulose nitrate, and oils, and is miscible with all common organic solvents, such as ketones, alcohols, and ethers. Butyl acetate is normally stored in drums, in a cool, dry, and well-ventilated facility away from oxidizing agents. It should be kept out of direct sunlight, heat, and open flames. Glycol ether, an organic liquid, is a fundamental solvent used in a variety of domestic and industrial applications. It is a clear, oily, colorless liquid with a mild odor. It is an important organic compound and a chemical intermediate. Glycol ethers have excellent solvency, chemical stability, and compatibility with water and a number of organic solvents. They are used in applications such as dyes, solvents for industrial cleaning, as solvents for insecticides and herbicides, icing inhibitor, and chemical reaction solvents. What are the upcoming hot bets for n-butanol market? How market dynamics is changing for different applications? Leading companies operating in the global n-Butanol market, including The Dow Chemical Company (US), OXEA (Germany), and Mitsubishi Chemical Corporation (Japan), have adopted agreements, expansions, and joint ventures as their key growth strategies between 2013 and 2017.